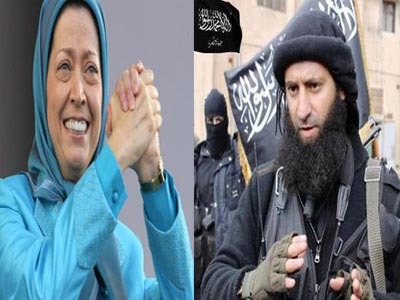 The anti-Iran terrorist Mujahedin-e Khalq Organization (MKO) has openly expressed support for the ISIL militants and their acts of terror in a clear indication of its wrath over Iran-Iraq cooperation against the Takfiri group. In a statement on Saturday, the MKO said any measure against ISIL would be a blatant violation of the UN Security Council’s agreements, IRNA reported. The terrorist organization also called for an immediate end to moves against the ISIL militants. The statement, without making any reference to the all-out cooperation among Iraqi Sunnis, tribes and army in the anti-ISIL fight, claimed that cooperation between Tehran and Baghdad in the battle against the ISIL terrorist group pursues anti-Sunni agendas. The ISIL terrorists control some parts of Syria and Iraq. They are engaged in crimes against humanity in the areas under their control. ISIL militants have terrorized and killed people of all communities, including Shias, Sunnis, Kurds and Christians. Earlier this month, Press TV learnt that Israel is training the MKO terrorists in Jordan along the border with Saudi Arabia in order to carry out acts of terror inside Iran and neighboring Iraq. According to sources, who declined to be named, the MKO terrorists are undergoing training on how to conduct terrorist operations in Iran and Iraq and are also receiving technical as well as information technology (IT) training from Israeli agents. 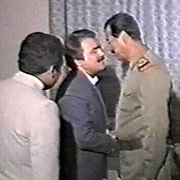 The MKO fled Iran to Iraq in 1986, where it enjoyed the support of Iraq’s executed dictator, Saddam Hussein, and set up its camp near the Iranian border. Maryam Rajavi’s annual Rally in Villepinte. This past Friday in Paris, the Mojahedin Khalq is held its annual rally to celebrate its violent past. This year, as every year, the MEK will pay both speakers and audience to attend. The annual rally is increasingly exposed and mocked by the media. Mojahedin Khalq is one of the rare forces which advertises and is proud of being a mercenary force. They never had an agenda of their own but have taken money from their paymasters, such as Saddam Hussein, Saudi Arabia and Israel. 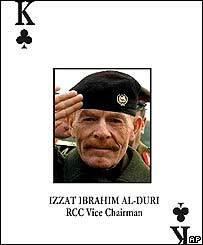 Although no government except Saddam Hussein’s regime has ever publicly condoned or supported the MEK, various Western agencies – the Pentagon, CIA, MOSSAD, the Israeli lobby and various neoconservatives – have at various times, and for various purposes, used the MEK. The MEK undertakes activities and poses in particular ways which suit their agendas – information laundry, assassination of Iranian nuclear scientists, and more, culminating in Maryam Rajavi’s disastrous, ludicrous attempt to pose as a human rights advocate in the Canadian Parliament in May this year. This time the annual rally is being held at the same time that Western leaders meet in Paris to discuss how to find a political solution to the crisis in Iraq. Each government is, of course, pursuing its own interests in Iraq and each wants to wrest the greatest political influence and benefit from the current crisis. But what they all share in common is the need to confront and stop the terrorist threat of ISIS in Iraq. Iraqi media and analysts identify this current manifestation of ISIS as a sophisticated military force – although said to be an offshoot of Al Qaida formed in Syria – as an element of the Baath Party (that is, the remains of Saddam’s regime), who had warned before that they would take revenge and create chaos and mayhem. Some ISIS equipment has been found to have previously belonged to the MEK. This is not a group which has newly emerged or lately come together, but is part of an existing cohort of groups and individuals prepared to use extreme violence to pursue political aims. The MEK are part of this cohort. While the violence of the triangle of Saddamists, ISIS and MEK in Iraq is ongoing, we witness that the MEK’s strongest advocates in the west, Struan Stevenson, Alejo Vidal-Quadras, Paulo Casaca and a couple of others have abandoned their mainstream political careers in the European Parliament and similar places to become full time advocates for this cohort. 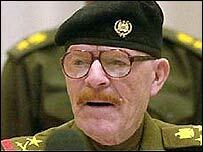 Under the organisational label ‘European Iraqi Freedom Association’ (EIFA), they claimed that the recent violent acts in Iraq were not carried out by ISIS, but were “part of a popular uprising” against Prime Minister Nouri al-Maliki. In doing so, they are openly backing the MEK, ISIS and Saddamist cohort against the government of Iraq even after successful elections returned popularly elected political representatives. For those with any lingering doubt about where the MEK stands on the issue of terrorism, an examination of their own website in Farsi is instructive. Only days before the current crisis erupted in Iraq, MEK leader Massoud Rajavi expressed his solidarity with the Saudi backed Jaish-ul-Adl terrorist group based in Pakistan. Referring to the execution of 16 men affiliated to Jaish-ul-Adl terrorist group Masoud Rajavi described them as “martyrs” and “brothers”. A screenshot of the MEK site’s first page quickly circulated on the internet as shocked Iranians of every stripe denounced the MEK. As the world looked on in horror at the actions of ISIS (beheadings, mass murders, etc), the MEK hailed the group as “revolutionary forces”, (an echo of the false identity it ascribes to itself as “Iran’s resistance movement”), and continued to advertise ISIS achievements and stances. The MEK’s collaboration with Saddamists and its public support for ISIS is unsurprising for experts on the group, but it is problematic. 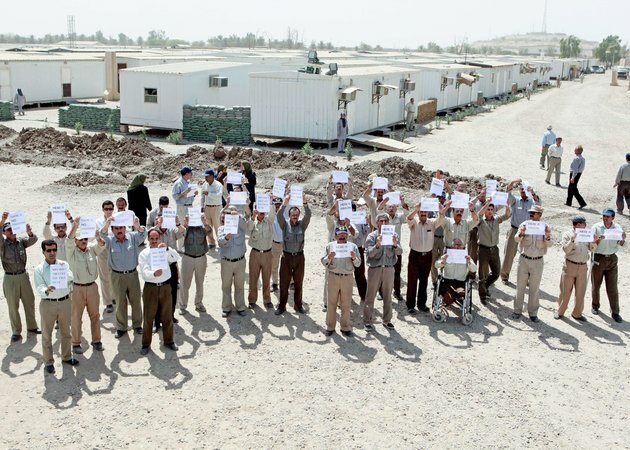 This support has made MEK in Camp Liberty a legitimate target for revenge killing by its old enemies – the Kurdish and Shiite populations among which the MEK massacred several thousand for Saddam Hussein during the First Gulf War in 1991. This matches with one of Massoud Rajavi’s recent internal proclamations; that should Camp Liberty be threatened by (unspecified) outside forces the residents should all kill themselves. In this way, Rajavi would be rid of many witnesses to his multiple crimes against humanity and war crimes. A meeting of ex members in Paris on 21 June highlighted this very threat. But this stance contradicts another of Rajavi’s positions, which is to use the forces in Camp Liberty as advertising products in the Paris rally. The speakers may admit to being paid, but they also claim to sincerely believe in the MEK’s ability to bring about freedom for Iran, and will no doubt be keen to use the platform in Paris to echo the demand to ‘rescue’ the Camp Liberty residents. Whether they are willfully ignorant of the facts or simply naïve is open to question. Indeed, both speakers and attendees should ask how this rally will help rescue the residents in Camp Liberty, Iraq, who the MEK leaders absolutely refuse to help. The UN has not hesitated to denounce the hindrances and obstruction created by the MEK leaders when it has tried to help these victims. In addition, the UN has accused the MEK of human rights abuses against its own members. Lobbying for what? survival of a terrorist cult? The idea that this rally is for lobbying is not only false but it is dangerous. Lobbying cannot involve the promotion of bloodshed and terror; that is murder. In any case, the MEK are not lobbying anyone for anything. The MEK is a cult and has its own agenda quite independent of its publicly stated policies. Its own internal interests are paramount and the current rally is being used to promote Maryam Rajavi as a replacement for Massoud Rajavi as the cult guru or ideological leader. 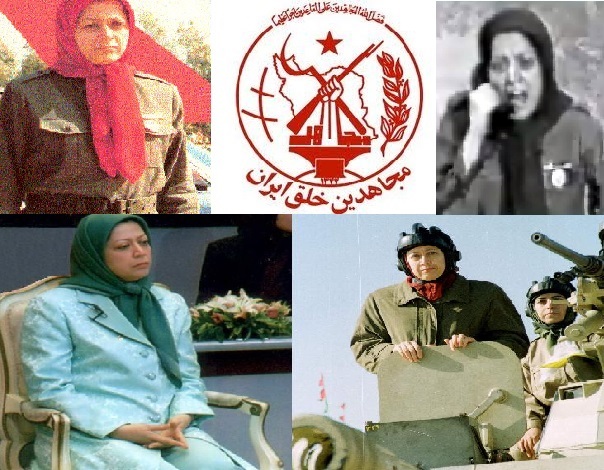 Everything the MEK has ever done has been to ensure its own survival; from working for Saddam Hussein to getting de-listed as a terrorist group. Governments, countries, agencies and lobbyists would do well to sit down and work out what have been their gains and losses because of using this organisation. For example, the MEK has not advanced the neoconservative agenda at all, instead because of its resort to violence it has benefited the conservatives of the Islamic Republic of Iran who use it to point out western double standards on terrorism. The MEK’s achievements in relation to its proclaimed stance are nil. Can MEK be trusted? beneficial? The MEK pretend to work as mercenaries to suit western backers but have in reality simply exploited loopholes and weaknesses in western political systems purely to promote themselves and, like parasites, find a niche to exist in for a while. The MEK have infiltrated parliaments and ministries and misused them. The rally in Paris on June 27th exploits the concept of ‘freedom of speech’ to promote a pretended political point of view. 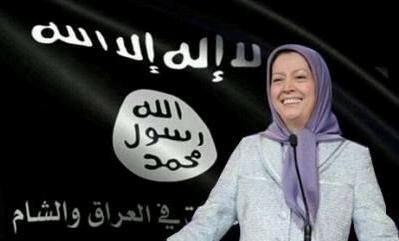 Given the MEK’s very clear and public support for ISIS, the fallout from this rally will affect everyone. While Western leaders are in the same city promoting the formation of a united front (according to configurations best suited to themselves) to confront the terrorist group, by turning a blind eye to a rally held by ISIS supporters in Paris, all western governments, not just that of France, are implicated in tacit support for that terrorism.